Maria is 24. She had a diving accident when she was 20, and now uses a wheelchair due to a physical disability. She has a 15-month old daughter, Sophia, with her long term partner, Graham. Sophia was recently subject to a referral to children’s services, who have contacted Adult Social Care to see whether they might be able to provide support to Maria. Graham is reported to not be happy about this. This case study considers issues around survivors with physical disabilities; multiagency working, adult safeguarding and child protection; and support to EU migrants. When you have looked at the materials for the case study and considered these topics, you can use the critical reflection tool and the action planning tool to consider your own practice. Maria, 24, lives with her 15 month old daughter, Sophia, and Sophia’s biological father, Graham (34). Maria came to live in London from Greece at the age of 18. Maria’s teenage years were difficult as her father was emotionally and physically abusive towards her and her mother. Maria took a business studies course and was involved in the University Diving club. She met Graham at the club and they have been together ever since. When she was 20 equipment failure during one of the dives caused Maria to sustain a spinal cord injury. Maria was rehabilitated from hospital. With professional support she was able to regain much of her independence although she suffers from chronic pain as a result of the injury, and anxiety and depression related to this. She uses a wheelchair and was allocated an accessible ground floor flat owned by a local housing association. Maria was advised that giving birth could further disable her but she was determined to have her baby. Graham moved into Maria’s flat when she told him that she was pregnant. Shortly after this she cancelled her contract with the domiciliary care agency. She said that Graham was able to do everything that she and the baby would need. Graham took time off work to be present at every ante-natal class. He works full time at a race track. He sometimes has to work late and he doesn’t always know until he gets there how long the shift will be. There has been a referral to adult services from children’s services. Children’s services have been alerted to concerns raised by health staff about Sophia’s lack of development, low weight and being frozen in her emotional responses. Maria is reported to seem tired, wary and dishevelled and potentially in need of social care support to be an effective parent. The housing association had had complaints from neighbours about the family’s dogs’ waste covering the shared ‘play’ area and that they seemed dangerous. Graham is reported to be offended at the idea that they are not coping as he now manages the household as well as working. In this section are two downloadable PDFs – one is a partly completed assessment form related to this case study, and another is an example of what a completed form could look like. What actions would you discuss with Maria to ensure her immediate and longer term safety? What precautions would you need to take to avoid putting her at higher risk of harm? What is your analysis of the situation? Is coercive control occurring? What is the evidence of this? 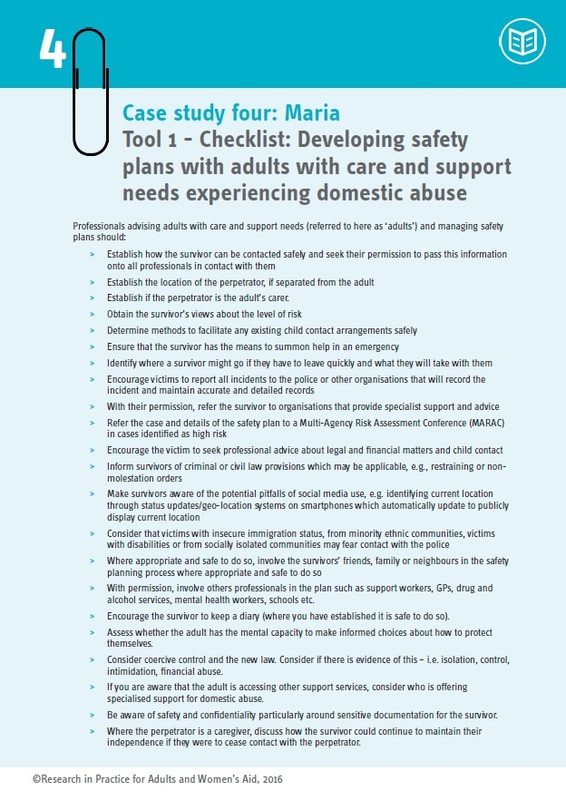 The purpose of the DASH risk checklist is to give a consistent and simple tool for practitioners who work with adult victims of domestic abuse in order to help them identify those who are at high risk of harm and whose cases should be referred to a MARAC meeting in order to manage their risk. If you are concerned about risk to a child or children, Safe Lives recommend that you should make a referral to ensure that a full assessment of their safety and welfare is made. There are two downloads on this page. One shows a blank DASH risk checklist, with quick start guidance from Safe Lives. The key point is to remember that your professional judgement is key in making a decision about risk; a tool can help, but the score it comes out with is not definitive. This is especially relevant when working with people with care and support needs, for whom some of the questions may not be relevant. The other shows an example of a completed DASH relating to this case study, for you to critique and appraise. Read the case details and full assessment document for this case study. Using the information contained, fill out a blank DASH risk assessment tool. Discuss how you found it; did you have all the required information? Would you be able to get all the required information in practice? Would you make a referral to MARAC? A selection of references, tools and further reading for each topic is below. ‘I mean, what normal wife would have all these professionals coming to the house and putting their hands all over her? All in the line of duty, but still—my body was for him alone . . .’ Bethany, a 36-year-old woman with multiple sclerosis, felt that her disability was an imposition on her husband; as a result, she felt obligated to sacrifice her home-based physical, speech, and occupational therapies … Bethany could not heal her disabled body; instead, she tried to limit its influence by surrendering her medical care. However, the abuse only escalated.’ (Rich, 2014:6). In conclusion, people with care and support needs are more vulnerable to domestic (& other forms of) abuse AND less likely to have access to the services and the protection that may be needed. Overarching tool on Making Safe Enquiries. ‘A victim may be fearful of their children being taken away if they make a report and the perpetrator may have tried to convince them that this is the case‘ (point 23: Home Office Guidance) . 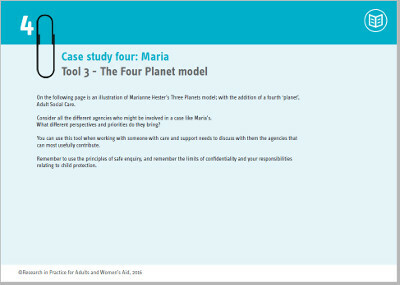 See also: Topics and tools from Case study 5 (Betty) relating to using MARACs. The increase in hate crime in England and Wales after the EU referendum vote was reported in figures published by the National Police Chiefs’ Council (Oct, 2016) showing a 49% rise in hate crime incidents to 1,863 in the last week in July 2016 when compared with the previous year. The week after saw a record 58% increase in recorded incidents whilst later data showed that the increase in hate crime continued, although the level of increase then dipped. Professionals advising adults with care and support needs (referred to here as ‘adults’) and managing safety plans should follow the checklist of actions. 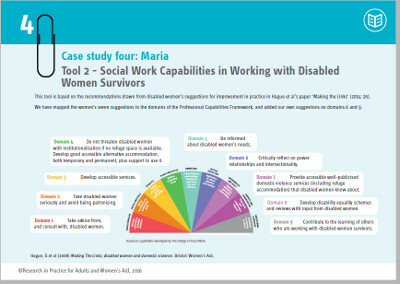 This tool is based on the recommendations drawn from disabled women’s suggestions for improvement in practice in Hague et al’s paper ‘Making the Links’ (2014: 26). We have mapped the women’s seven suggestions to the domains of the Professional Capabilities Framework, and added our own suggestions on domains 6 and 9. Based on Marianne Hester’s Three Planets model; with the addition of a fourth ‘planet’, Adult Social Care. Consider all the different agencies who might be involved in a case like Maria’s. You can use this tool to help you consider the whole family in an assessment or review. Establish if the perpetrator is the adult’s carer. With permission, involve others professionals in the plan such as support workers, GPs, drug and alcohol services, mental health workers, schools etc. Encourage the survivor to keep a diary (where you have established it is safe to do so). Assess whether the adult has the mental capacity to make informed choices about how to protect themselves. Consider coercive control and the new law. Consider if there is evidence of this – i.e. isolation, control, intimidation, financial abuse. If you are aware that the adult is accessing other support services, consider who is offering specialised support for domestic abuse. Be aware of safety and confidentiality particularly around sensitive documentation for the survivor. 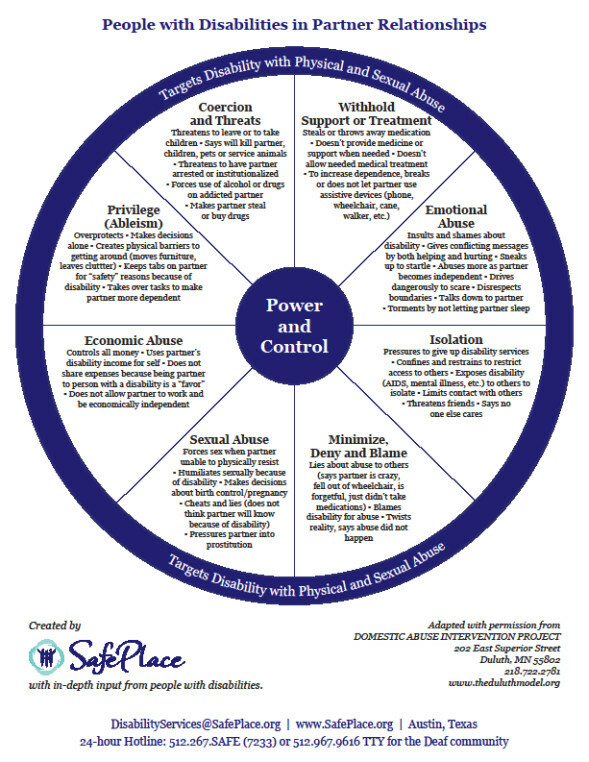 Where the perpetrator is a caregiver, discuss how the survivor could continue to maintain their independence if they were to cease contact with the perpetrator. Domain 1 Take advice from, and consult with, disabled women. Domain 2 Take disabled women seriously and avoid being patronising. Domain 3 Develop accessible services. Domain 4 Do not threaten disabled women with institutionalisation if no refuge space is available. Develop good accessible alternative accommodation, both temporary and permanent, plus support to use it. Domain 5 Be informed about disabled women’s needs. Domain 6 Critically reflect on power relationships and intersectionality. Domain 7 Provide accessible well-publicised domestic violence services (including refuge accommodation) that disabled women know about. Domain 8 Develop disability equality schemes and reviews with input from disabled women. Domain 9 Contribute to the learning of others who are working with disabled women survivors. Hague, G et al (2008) Making The Links; disabled women and domestic violence. Bristol: Women’s Aid. 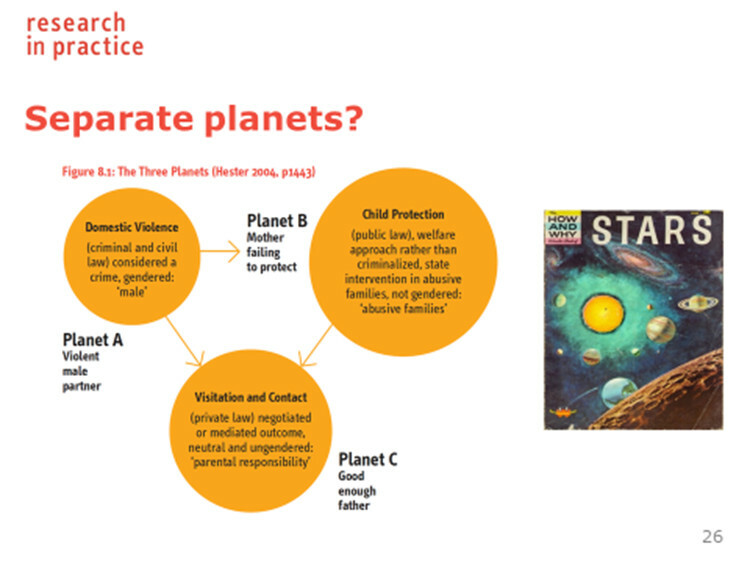 Below is an illustration of Marianne Hester’s Three Planets model; with the addition of a fourth ‘planet’, Adult Social Care. What different perspectives and priorities do they bring? You can use this tool when working with someone with care and support needs to discuss with them the agencies that can most usefully contribute. Remember to use the principles of safe enquiry, and remember the limits of confidentiality and your responsibilities relating to child protection. Rich, Karen (2014) My body came between us: accounts of partner-abuser women with physical disabilities. Journal of Women and Social Work, 1-16.